With the formal retirement of the old Home Theater Master brand and the formation of the new Complete Control name for professional products, URC’s exact strategy for marketing consumer remotes has taken a little while longer to stabilize. 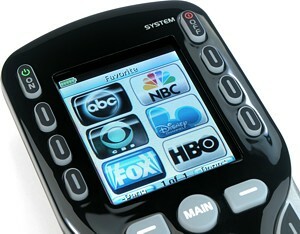 Currently made up of an “R” series of remotes sold directly under Universal Remote Control’s own name, the lineup includes the aforementioned mid-range RF10, RF20 and RF30 LCD models, plus the low-end R6 and R7 clickers. While the R50 shares literally no design cues from the rest of the R series, it does have a direct counterpart in URC’s professional line: the Complete Control MX-450. That model is priced at $249.99 USD MSRP, with the extra $100 in cost affording the MX-450 a higher-end finish, built-in RF, more advanced on-screen macro programming, and the possibility of firmware upgrades and configuration backups via a USB port (although it still can’t be programmed by a PC). Walk softly, carry a big remote! The R50 may not be even close to the largest remote I’ve reviewed, but it certainly can’t be called “dainty” either. Measuring 2.30” wide, 8.97” long and 1.26” thick (5.9cm by 22.9cm by 3.2cm) the R50 is of average size, perhaps a bit thicker than usual. But what makes it stand out is how much it weighs for that size: 8.8 ounces (247 grams) with batteries; a more lithe 5.3 ounces (150 grams) without. Readers will be pleased to note that the weight has gone primarily to a good cause: batteries. Although the R50 doesn’t include any sort of rechargeable docking system, it’s the first “stick” remote from the company to use standard AA batteries instead of their smaller AAA counterparts. 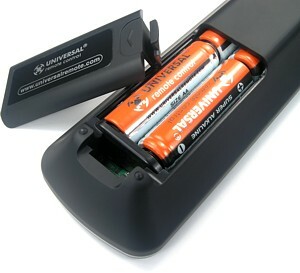 AA batteries weigh twice as much as AAA ones but they also hold two-and-a-half times the power, affording longer runtimes between battery changes and lower operational costs (since they generally don’t cost more). A button for every function, and every function in its place. The R50’s design may not break new ground, but it adheres to what has worked successfully for the MX-500 and many other remotes: a medium sized LCD screen at the top with customizable hard buttons, plus a respectable selection of regular hard buttons below. As the most notable feature of the R50, I’m pleased to see that the TFT LCD screen is of good quality with bright, vibrant colors and tack-sharp definition. It measures 1.23” wide and 1.53” tall (3.1cm by 3.9cm) with a 1.96” (4.9cm) diagonal dimension. The display has a resolution of 176 by 220 pixels, something most commonly seen with cell phones, and a high pixel density of 144 PPI. Positioned on either side of the screen are four thin hard buttons. The larger top row are master power keys for turning your A/V system [On] and [Off], while the 6 other keys use the LCD screen for labels and will perform different functions depending on whatever the label reads.